The perfect integration of a product within the customer’s assembly process can be just as critical to the success of that product as the electrical performance. Mini-Circuits and many RF/microwave component manufacturers build surface-mount components that are soldered onto customers’ PC boards using a reflow process. Following reflow, the board must be cleaned to remove solder balls, flux, salt deposits and other debris. While a number of cleaning methods exist, the industry—and especially manufacturers of equipment for military and other hi-rel applications—has gravitated towards aqueous wash. A conformal coating is then applied to protect the circuit from moisture and other adverse environmental conditions. This process poses unique challenges for the integration of surface mount parts into customer assemblies, particularly components with open and semi-sealed case styles. 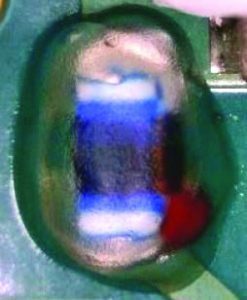 This article presents a proprietary technique Mini-Circuits has developed to adapt non-sealed surface mount components for customer assembly processes, preserving high reliability after aqueous wash and conformal coating. Plastic encapsulated MMIC devices. Examples include QFN and SOT-89 case styles. A semiconductor die is wirebonded to bonding pads and sealed in a plastic enclosure. Ceramic, hermetically sealed cavity packages for hi-rel requirements. MAC-series mixers, for example, incorporate a semiconductor die on GaAs wirebonded to baluns embedded in an LTCC multi-layer substrate. The die is hermetically sealed in a controlled nitrogen atmosphere. Plastic encapsulated and hermetically sealed components are generally well-suited to hi-rel assembly processes without any special adaptations. Open and semi-sealed components, however, are susceptible to performance shifts and even catastrophic failure when exposed to the conditions of aqueous wash and conformal coating processes. During aqueous wash, components are fully immersed in de-ionized water at high temperature, which can ingress into the unit package and become trapped. After aqueous wash, moisture, along with any contaminants trapped inside the case of semi-sealed units, can lead to dendritic growth, shorting, corrosion and a variety of other known reliability risks. Open component assemblies are less problematic than semi-sealed assemblies with respect to trapped moisture, but for some more sensitive open structures such as filters and diplexers, the customer’s conformal coating can change the dielectric properties of the circuit, resulting in shifts in RF performance. For example, mixers and limiters are generally unaffected by contact with conformal coating, whereas VCOs and diplexers are sensitive and unsuitable for conformal coating unless contained in a sealed case. 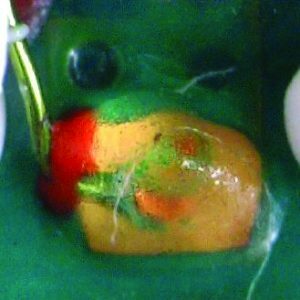 In an ideal world, we would simply adopt hermetically sealed cavity packaging for everything to withstand customers’ assembly processes, but there are practical limits to this solution. Hermetic packaging adds significant cost to the component, and it is highly impractical to make hermetically sealed packages for larger structures. Therefore, an alternative technique to adapt open and semi-sealed surface mount components for hi-rel assembly without adding extraneous cost or technical inconvenience to the process is highly desirable. In response to customer requirements for open and semi-sealed components in our catalog for systems undergoing hi-rel assembly processes, Mini-Circuits developed a proprietary sealing method to protect these components during the aqueous wash process and enable them to operate reliably within the customer conformal coat. A special pre-coating is applied to certain areas of the Mini-Circuits unit, which prevents direct contact of the cleaning solution and the customer’s conformal coat with the unit’s sensitive circuitry. This pre-coating has been qualified to withstand the conditions of customer reflow, aqueous wash, and conformal coating processes without failures or shifts in RF performance. The pre-coating seals the sensitive areas of the unit such that during the customer’s reflow process, there is no wicking of solder or creation of solder balls in the sealed structure, which would otherwise cause reliability problems. 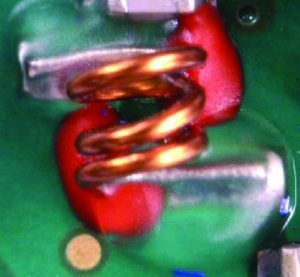 This economical technique can be used to adapt open or semi-sealed surface-mount components in Mini-Circuits’ catalog to preserve reliability in hi-rel assembly processes for minimal increase in cost. The trend toward aqueous wash and conformal coating in hi-rel applications means components that were once universally used will be increasingly unsuitable for integration into customer assembly processes in their standard form. Fortunately, Mini-Circuits has now developed a cost-effective approach to adapt non-sealed surface mount components for outstanding reliability in customer assembly processes involving aqueous wash and conformal coating. This gives customers the freedom to select components without limitations based on case style. Open and semi-sealed parts may be adapted for customers utilizing aqueous wash and conformal coating without adding inordinate cost or complexity to their board design or assembly process. If you have questions regarding the pre-coating process described here, please contact apps@minicircuits.com for additional information. next Your Guide to Waveguide Plumbing: How Do Waveguides Bend, Twist, and Flex?